working and personalised, seamless service provision. The university provided research and evaluation expertise and acted as the learning hub for shared learning, using a “hub and spoke” approach. 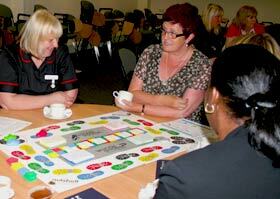 This included developing a care pathway for frail elderly individuals and people with dementia. Ann Saxon, Head of Continuing Education and Workforce Development, School of Health and Wellbeing at the University of Wolverhampton, first came across Whose Shoes? when she attended one of Gill Phillips’ workshops, held as part of the national “Thinking outside the box” conference, hosted by Skills for Care, Skills for Health and Skills for Care and Development in Newcastle in June 2010. Ann immediately saw the potential of the tool in the context of Project 9 which was due to begin and commissioned Gill to run a series of Whose Shoes? workshops. and how readily the messages triggered the necessary conversations about in-depth health issues even though the tool was primarily designed around the social care agenda. The next workshop was hosted by Walsall Council and introduced by Paul Davies, Executive Director, Social Care and Inclusion, this time involving over 60 staff and service users from across the whole region. Whose Shoes? was successful in getting people around the table, building relationships and exploring issues affecting their respective services – for many, a unique opportunity. There was a huge buzz in the room as everybody pitched in to have their say, lots of laughter and some serious moments. For example, some workers from very different “perspectives” on mental health (commissioners and hospital workers) found themselves on the same table and thrashed out some important points around new practices. 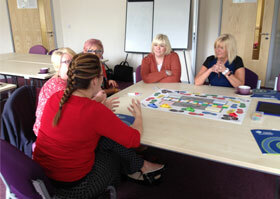 A group of people using local services who attended the second workshop subsequently requested a further Whose Shoes? 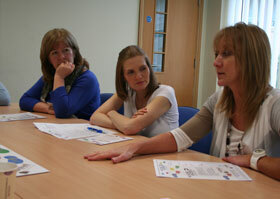 session, specifically for service users, which went ahead in December 2011. This workshop was further enhanced by Nutshell’s close associates, New Possibilities, who created a wonderful graphic record of all the points raised by participants. The graphic representation serves as a tool to identify and record gaps in provision, feeding back improvements to public providers and helping to ensure that suggestions are listened to and actions followed through. The interim findings of the role of Whose Shoes? in this Black Country project have so far been reported by Gill Phillips and Ann Saxon, co-presenting at the “Excellence out of Adversity” conference in Glasgow and the West Midlands Social Work Practitioner Symposium in Birmingham. The University of Wolverhampton are just completing a final report. Contact us for further information. Whose Shoes? is interactive and allows service users to participate with health and social care staff to discuss issues that have real meaning for them. It enables action planning to take place and organisations to really address the personalisation agenda. The tool is currently being used by students at the University of Wolverhampton as part of the learning disability nursing course. The game has been easy to facilitate and opens up a range of development opportunities”. 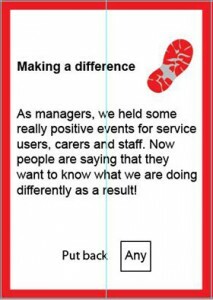 Philippa Codd, then Service Excellence Director of the Careforce Group, contacted Whose Shoes?® creator Gill Philips, when one of her Regional Managers told her they had seen ‘a brilliant Personalisation game’ and she should try and see it. Philippa, who is incredibly passionate about improving the way home care is delivered and meeting the aims of personalisation, thought Whose Shoes? sounded like a learning and development tool that managers and staff would embrace and enjoy at the same time. 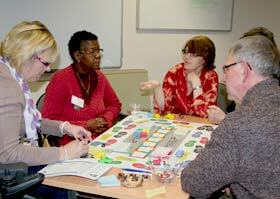 It was important to see the game in action, so it was decided that Gill would meet Philippa in Birmingham to demonstrate how the tool worked. Philippa was working very closely with Birmingham City Council Adult Social Care, to redesign some of the existing home care provision and introduce a Reablement programme into all care packages. She decided to utilise Gill’s visit and set up a workshop, inviting her local Registered Manager, Care Supervisors and two key Managers from the City Council: a Strategic Commissioning Manager and Contracts Manager. A potentially highly contentious issue was identified, addressed and subsequently resolved - magic!" A lively session followed, with excellent debate, hearing from the Commissioners, Registered Manager and front line staff. This lasted the whole morning and the group managed to break down some barriers which were causing a problem and preventing Careforce moving forward to pilot a new way of managing their contracts. As a result of the workshop, both provider and commissioner agreed an alternative invoicing mechanism to allow more flexibility for service users and a stronger partnership at a local level. Philippa has used the game many times since in similar situations, each time, increasing the knowledge of all stakeholders present and defining a better way to move forward. 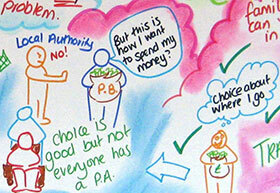 It was fascinating to watch as a couple of key scenarios emerged from the "providers and commissioners" pile. Suddenly the issues were as clear as day: people were being asked to work more flexibly… but the systems prevented this! Brilliant to hear that this was subsequently resolved, ultimately benefiting service users wanting to stay fit and independent in their own homes"
Whose Shoes?® has proved to be a very popular tool with students. Ali Gardner, Senior Lecturer at Manchester Metropolitan University. 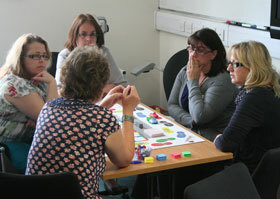 Ali was an early champion, using the tool regularly with BA and MA Social Work Students. Gill Phillips has co-facilitated several sessions. Students say that the tool helps them bridge the gap between theory and practice. Building on this work, Gill and Ali held a Whose Shoes? research / co-production event in Manchester, sponsored by MMU and JIP North-West. They invited people with as many different "real-life" perspectives as possible. In this context, 90% of the learning came from the people around the table; the game just serving as a tool to trigger the "crucial conversations". 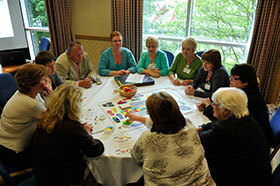 Workshop participants from across the North west region ‘played’ Whose Shoes? in a fully interactive, whole day event and used the scenarios to debate some of the key challenges to both social work and social work training in relation to the personalisation agenda. The messages encompassed choice versus risk, paternalism versus citizenship, and the challenge for providers of catering for individual preferences after the security of “block contracts”. The importance of universal services, social capital, early intervention and prevention were highlighted, with many practical examples of the importance of highly developed interpersonal skills and excellent communication at all levels. Gill Phillips and Ali Gardner have enjoyed many opportunities to explore Whose Shoes? together with a wide range of audiences, for example co-presenting workshops at the JSWEC conference in Hatfield and the International Inter-professional conference in Manchester. Gill Phillips, creator of the tool, had expected it to be local authorities who were perhaps ‘struggling with personalisation’ who would want a tool to help them make progress. In fact, the opposite trend was seen. It was generally the “3 star” social care L.As, who came on board. 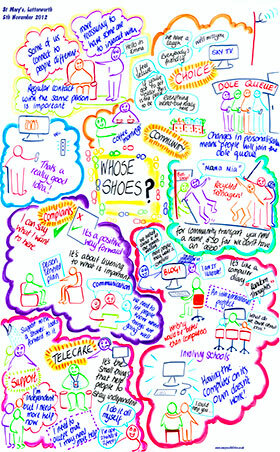 Whose Shoes?® session with Force 4 Change, a user-led group in Leicestershire . Exploring the group’s key issues and mapping to ‘Making It Real’. 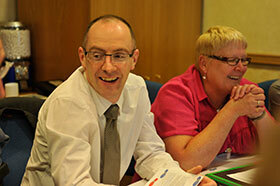 Leicestershire County Council were early and enthusiastic Whose Shoes?® customers. They invited Gill to run an extended Whose Shoes?® workshop, with space and time to explore issues through in-depth discussions. They involved people using services from the outset and Gill was delighted to makean early link to Force 4 Change, a user-led group that later blossomed into an on-going relationship. Two very creative and inspiring people from the Learning and Development Team, Sarah Wiglet and Juliet Heaton, were given scope to develop a programme of training that used the full potential of the tool and received consistently positive feedback from participants. Who else would think to build the tool into a wider ‘Walk in my shoes?’ training day complete with DVD and song? You see... It is possible to have a bit of fun while discussing serious topics – it helps people be relaxed and to speak openly and honestly. There is a detailed good practice case study on use of Whose Shoes? by Leicestershire County Council on Governance International website. Community Care magazine similarly published a feature based on this project, demonstrating the impact Whose Shoes?® is having across the UK. It takes a certain amount of courage to ask people to tell you what they think of you. And it takes a relaxed, informal atmosphere to encourage people to be open and honest. And so it was when Cherwell Care, a home care provider in Oxfordshire, invited their clients along to an innovative "Growing Our Community" event - and really listened to what they had to say. The aim was to deliver a truly person-centred service, reaching out to the local community and promoting independence and choice. The afternoon started with a Whose Shoes?® workshop led by Gill Phillips, exploring mobility, nutrition, independence, use of technology and the wider challenge of people ‘staying connected’ in the community. We considered the roles of not just family and friends and informal carers but people such as bus drivers, shop assistants, hairdressers… people who really have a chance to influence whether older people "have a nice day" - or not! There was a real buzz in the room. 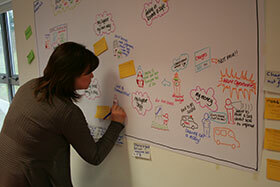 A constant stream of post-it notes was fed through to Carrie, our talented graphic facilitator from New Possibilities. Before long the huge blank piece of paper on the wall was filling up with words and pictures reflecting all the “expert by experience” points that were being made about what it is like to grow old in the 21st century. The rest of the afternoon passed in a whirl – socialising over a traditional afternoon tea with tiered cake stands and posh tea cups; a "growing" demonstration by “the Flowerpot Men” including how to grow your own vegetables, even in tiny spaces; and new friendships blossoming. The wide ranging discussions were very revealing. One lady had felt obliged to get out of her hospital bed to help others who couldn’t reach their drinking cups. Another said she was not allowed to help set the table in her day centre unless she was wearing rubber gloves. Age UK Silver Surfer courses had brought a whole new life to one man; helpful families, neighbours and reliable care staff were much appreciated as were meals delivered to the door; alarm systems to reassure the family; and recommended, trusted handymen. There was special praise for a bus driver who always waited until everyone was seated before setting off, thereby giving people confidence to use public transport. There were lots of great suggestions that would not cost huge amounts of money: more seats inside shops, and practical sharing of ideas and simple tips – a rather deaf couple now know how to get subtitles on their television! There was a real buzz to the afternoon – it was a very sociable event but the clients said very clearly what was working well already and what needed to improve. The focus then shifted to ACTION to make a difference, working through all the issues recorded by the graphic facilitator. Cherwell Care owners were visibly thrilled to have had the chance to meet their clients and to explore and record the things that were important to them. They were open to new ideas and improvements, which were systematically followed up. Owner Graham Barclay said “We have a real opportunity to develop the service in line with clients’ wishes. This will be really crucial over the next few years”. For more detail of how the event was followed up, please see a special guest blog by the mastermind of the event, Philippa Codd. Gill Phillips was invited to present a Whose Shoes?® workshop in November 2012 at St Mary’s Extra Care scheme in Lutterworth. This was part of a project for Leicestershire County Council’s Innovation Challenge, co-ordinated by Community Catalysts. 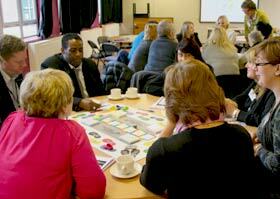 The session was attended by an ideal mix of residents, family carers and staff. Sally Taylor, Head of Supported Housing for East Midlands Housing Association (EMHA) and representatives from Age UK who provide care services also participated. This wide range of perspectives always makes for a lively session, and Anna Geyer from New Possibilities supported with expert graphic recording. The aim was to explore how people felt about living at St Mary’s, what they liked and disliked and any issues that they wanted to raise. It was also an opportunity to reflect on the fabulous inter-generational Arts project many of them had recently enjoyed. Residents were clearly very happy with their lives at St Mary’s. One look at the fabulous refreshments provided and the general feeling of well-being in the room, told us that nutrition was not really an issue. However, discussions about staying connected in the community and the new strong relationship (through the Arts project) with the local primary school led to fascinating discussions about how people felt about computing and technology and how St Mary’s could build on this new local link. 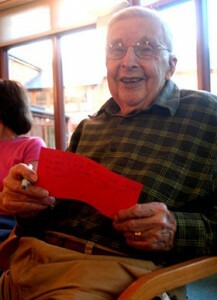 Gill’s 90 year old mother attended and became a bit of a reluctant star as she had published a blog post in Gill’s “In my shoes” guest blog series that day. This led to great interest and much merriment about blogging and the use of computers and technology. It became very apparent how important language and clear explanations are. One lady was initially very resistant to the whole concept of blogging but then revealed that she loved writing and kept a diary. Changing times, changing words. But everyone agreed how important it is to feel connected and valued. We looked at practical ways for people to understand technology better. Someone suggested a further schools project around computer buddying; someone else wanted to try using a Wii! We concluded by writing some poems and tweeting live about our afternoon, again combining traditional and modern forms of communication. This is how Whose Shoes?® sessions work – the tool naturally opens up the topics that the participants themselves want to talk about and starts to identify where their challenges or key issues lie. And everyone had a great time! There was a lovely vibrant atmosphere – some of the group told us they call themselves “The Recycled Teenagers” when booking Community Transport. No Asbos were issued... Now EMHA and St Mary’s are following up, with the residents, the issues raised. Why is it that it the best providers always want to improve further whilst others never enable their clients to ‘have a voice’...? 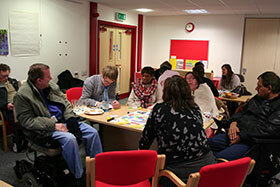 ‘Force 4 Change’ is a very lively group of people with disabilities who use social care services in Leicestershire. In February 2012, on a snowy Saturday afternoon, we held an innovative Whose Shoes?® workshop with this ‘user-led’ organisation. We were joined by several social care professionals who had all volunteered to come along to participate, listen and learn. Through the amazing graphics of Anna Geyer, New Possibilities, we used TLAP's ‘Making It Real’ as a framework for collecting the issues raised and empowering the group to hold further discussions with the council and other interested parties. 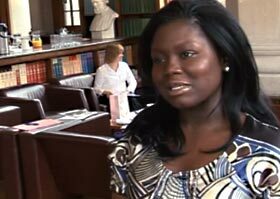 Frankie Hine-Hughes from Governance International helps ensure no important issues are missed. 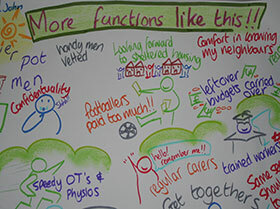 What is it like to be someone who uses services or a carer? 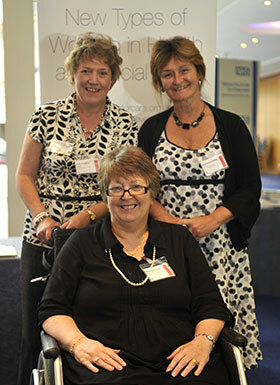 What is it like to be a manager, a social worker, a commissioner or a care provider? What are the real opportunities and challenges? How can we all work more effectively together? The room buzzed as the lively group used Whose Shoes? to help them tease through the key issues of personalisation - what is really working well and what more needs to happen to "make it real" for people who need support with social care and health needs? 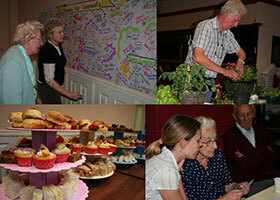 It was a very informal, enjoyable and well received event. We thank the members of Force 4 Change sincerely for allowing us to film at the session. We only took a few minutes of video as we were all too busy with the discussions! At the end of the event, we managed to do an impromptu interview with Karen Kidd, chair of the group. Karen tells us that she suddenly appreciated what it can be like to be a social worker, sometimes “caught between a rock and a hard place,” trying to do their best for the person using services while also meeting the requirements of managers. This is a great example of how Whose Shoes? works, as it is through increased empathy and understanding about all roles that people work better together for positive change. What is happening... and what still needs to happen to "make it (personalisation) real" for these individuals and other people with care and support needs in Leicestershire? Gill Phillips was successful in winning a Skills for Care / Skills for Health ‘Meet the Dragons’ award to co-produce an innovative Whose Shoes?® project in Yorkshire and Humber. The competition took place at the ‘Think outside the box’ conference in Newcastle, June 2010 and, after first getting past the ‘Dragons’, was judged by the audience in a packed hall. The ensuing local project was formulated and very ably led by Barbara Dalby and Sharon Terry, experts by experience. Experts by experience led six sessions with commissioners and providers of social care services across the Yorkshire & Humber region. All sessions were very well received and highly successful. It was identified that people found it hard to develop personal budgets because of the terminology used and variations from different areas and services. Often people didn't know what they needed to ask to get the information they needed. 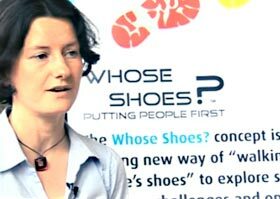 Using the Whose Shoes?® tool with groups including professionals and experts by experience on an equal footing using everyday language enabled people to think creatively about how the most benefit could be gained from limited resources. The scenarios posed by Whose Shoes?® enabled everyone to share their knowledge or expertise or highlight where they needed to do more research. Social care managers / commissions / providers / workers need to have the ability to put themselves in the shoes of the people they work with and for. Service Users and carers are well able to evaluate their own needs and the priorities for their own health and wellbeing when a tool like this is used to create the right environment for open discussion. Exploration and negotiation of possible solutions can produce a good outcome and effective use of resources. People using services and informal carers often feel disempowered and in awe of care managers. Professionals may feel worried about 'protecting' resources or endorsing solutions that are unconventional. A relaxed approach can help everyone to feel more comfortable and equal. Huge appreciation and thanks to, Sharon Terry, a personal budget holder and Barbara Dalby, who cared for her two disabled and elderly parents. For more information click here. Whose Shoes?® is a tool that is easy to use. 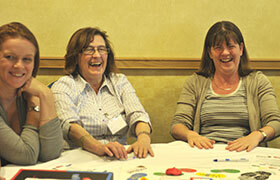 However, like most facilitation tools, it works even better if there is a skilled and creative facilitator! Ashleigh Niven, Personalisation Development Manager for Enable (Scotland) is a real Whose Shoes?® champion and has shared lots of tips about how to get best value from this resource. So it was not surprising that, when Ashleigh got promoted from her previous role as Team Leader, she and her team thought of a way to use Whose Shoes?® as part of the recruitment process to find a successor! It is the first time we have heard of this particular application so we asked Ashleigh’s team to tell us what they did. Thank you to Ashleigh Niven, Pauline Buchan and Jenn Hall for sharing this innovative approach and to Pauline for writing the case study. We held a group interview for 15 candidates for the role of Personalisation Development Manager within our organisation. This group interview was designed as a values-based interview with inclusion being at the forefront. We wanted to get an insight into the individuals own personal values and leadership skills and observe how they interacted with each other and the co-facilitators who were an integral part of the interview panel. When designing the group interview process we knew that we wanted to do something really creative and unique that would allow people to excel. We also needed the process to be something that our co-facilitators (a group made up of the people we support) could fully participate in and express their views over their preferred candidates. We really wanted to see how the candidates would deal with particular attitudes and opinions that we are faced with on a regular basis. To do this we selected two cards from Whose Shoes?®. The first of these was the ‘Shock! Horror! Probe!’ card. We gave them this scenario and asked them to write a newspaper article in response to this, in particular challenging the viewpoint and promoting the benefits of people being able to use their budgets in flexible ways including purchases such as this. After they wrote their articles, we broke into groups of three candidates, each with a facilitator and a co-facilitator and asked them to feedback. This was a fantastic exercise as people really got the opportunity to shine and demonstrate their values, knowledge and passion on personalisation. It also gave people the opportunity to challenge the exclusion that many of the people we have supported have suffered throughout their life journey. We also wanted to see how the candidates would address a challenge that is being asked in most areas about how personalisation will work for people with complex support needs. For this we used card B24 (a card about people being too ill or disabled to say what they want). We asked candidates how they would support people with complex support needs or those who do not use words to communicate to identify meaningful outcomes. We also asked, what are the other ways in which you can maximise the level of control in that person’s life? We asked them to prepare a short presentation on this to be delivered to the group. This allowed us to see their presentation skills but also gave us some insight into what approaches / tools they might use and also let us see how creative the person was. This approach was well received and gave us greater insight into the person’s skills and abilities to do the kind of work that this role requires. People can talk a very good game when it comes to an individual interview but what was really interesting was seeing how the candidates interacted with each other / the competition and in particular how well they engaged with the people we support." At the end of this process we sat down and discussed with the co-facilitators how they felt about each candidate and who they would like to be invited back for individual Interview and the reasons behind this. We took pictures of all candidates to help facilitate this discussion. Overall this was a great experience and the feedback from the participants was that they got a lot out of it. The second exercise was the decider! People’s real values shone through and we reduced our list of candidates down from 15 to 5." 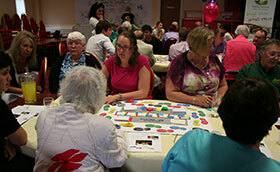 We are loving using Whose Shoes?® for the events we are facilitating, there are so many creative ways to use it!"